GRAFENWOEHR, Germany — U.S. Army Garrison Bavaria headquartered in Grafenwoehr hosts the 2017 U.S. Forces Europe Army Ten-Miler Qualification Race at the Tower Barracks Physical Fitness Center, Bldg. 170, Sat., June 24, 2017, beginning at 8 a.m. 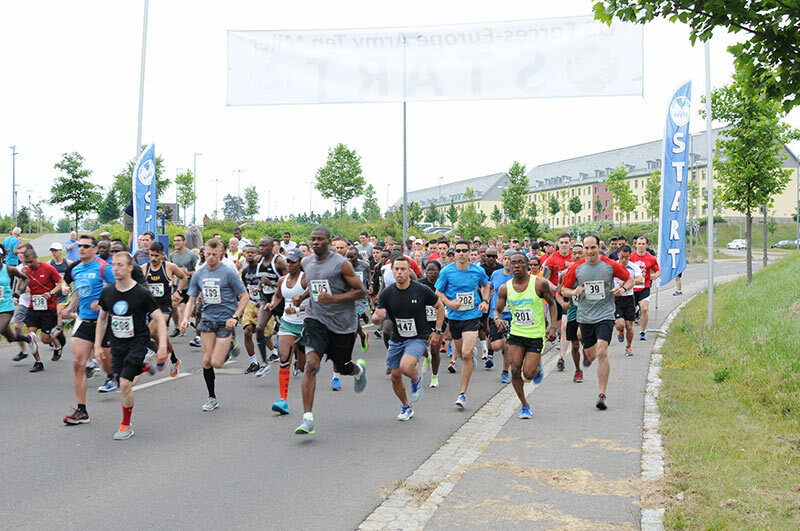 While only Soldiers can compete for the U.S. Army Europe team, everyone stationed in Europe 18 and older with a U.S. Department of Defense ID card may participate in the June 24 race. Each Garrison may enter men’s and women’s teams into the race. A minimum of four to a maximum of six personnel are allowed to compete as a team. Garrisons are authorized unlimited teams. The top six Army male and female qualifiers will represent USAREUR in the Army’s 33rd annual Army Ten-Miler Oct. 8, 2017, in Washington, D.C.
Qualifiers must meet minimum qualifying times — for men that is 69:59 minutes and for women it is 89:59 minutes, according to the qualification run memorandum of instruction. The U.S. Army Ten-Miler is the third largest 10-mile road race in the world. The race course begins and ends at the Pentagon in Arlington, Virginia, and runs through the National Mall in Washington, D.C. The Army Ten-Miler is organized by the U.S. Army Military District of Washington with proceeds benefiting Army Family and Morale, Welfare and Recreation, a comprehensive network of support and leisure services designed to enhance the lives of Soldiers and their families. Details about the Army Ten-Miler in Washington, D.C., are available at armytenmiler.com. Troop billets in Grafenwoehr are available on a first-come, first-served basis. For more information, contact the USAG Bavaria Recreation Division at DSN 475-9024, CIV 49 (0)9641-83-9024. For those preferring to reserve a room at Army lodging at Grafenwoehr’s Tower Barracks, call DSN 475-1700, CIV 49 (0)9641-9-3640. Reserve a room in Army lodging in Vilseck at Rose Barracks’ Kristal Inn by calling DSN 476-1700, CIV 49 (0)9662-83-1700. Pre-register at grafenwoehr.armymwr.com. Individual and team registration forms are available at the Ten-Miler Qualification page.